Families enjoy spending their leisure time together, whether it is a special day out or an extended vacation, so why not take your dog with you? More and more places now welcome dogs, so you should make sure he arrives safely and in style, no matter what mode of transportation you choose. Here are some tips on how to travel with your dog weather your are making short trips, long distance or even traveling abroad. Do not feed him before the journey. Give him half a ginger cookie before the journey, which will settle his stomach. Try to position him so that he cannot see out of the window because the chances of motion sickness are reduced if your dog cannot see the outside world whizzing past. There are many products on the market that help with dog anxiety, stress reduction and nausea. I can suggest the following Complete Clam product if you think your dog will be in such a situation. Complete Calm contains all natural ingredients and it is made in the United States. Make the car a welcoming place to be while it is stationary by giving your dog his meals there or by offering some favorite treats. Get your dog used to the car by taking him on a few short journeys and always returning home to a game. Gradually build up to longer journeys that again always end in a great walk or a game rather than a bath or a trip to the vet. Most dogs have to make journeys by car, even if it is just to the vet for a check-up or regular vaccinations. All dogs should be secured in the car behind a dog guard, in a crate or by a specially designed car harness. Pop-up tents that fit into the trunk of your car are now available and they are less cumbersome than a rigid crate. These work great and are very convenient, some of them are even made of durable mesh to prevent your dog from tearing it. Here are some purchasing options for Pop-up Tents & Portable Pet Containment Systems. It may seem obvious, but before you set out with your dog make sure that you check that he will be welcome at your destination. Some guidebooks include this type of information, and the websites of many “attractions” will indicate if dogs are allowed. There may well be occasions in your dog’s life when taking public transportation is essential. This experience has the potential to be noisy, over-crowded and overwhelming for your dog’s sense of smell and personal space. If your dog is small enough, a pet carrier may be the answer. It will keep him out of harm’s way and will allow him to rest during the journey. However, larger dogs will have to learn to cope with the hustle and bustle, the strange movements and sounds and the likelihood that people will want to stop and say hello! The best way to help your dog with these situations is to get him used to them while he is still young. 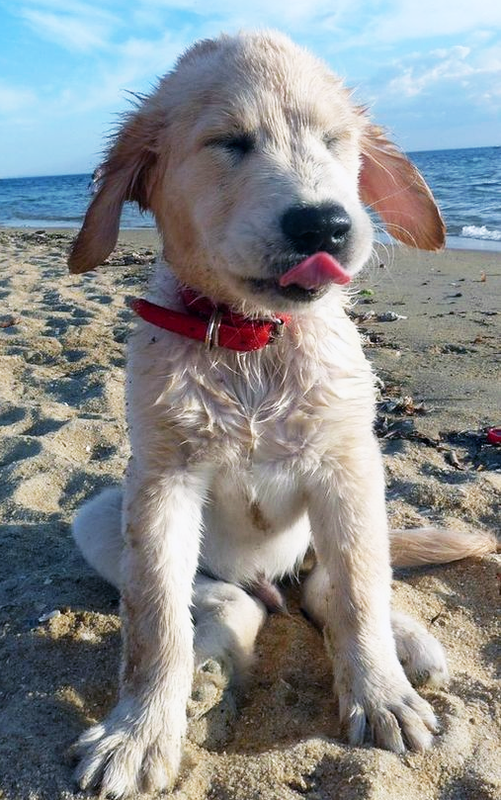 Take your puppy out and enjoy the experience together. He will soon learn that, however strange and unfamiliar the experience, you will always be there by his side. Before you go, check and make sure that the train or bus allows pets. Make it fun and your dog will enjoy it too! There are many places that you and your dog can visit together. Some churches, parks and open-air museums are open to all members of the family. How about a cross-country walk or even a tour of a local city or town? When you are traveling around town with your dog you have a number of options. You might decide to walk together, or you might prefer to carry your dog in style. There are some great pet carriers available for smaller clogs, from the practical – a crate on wheels to the stylish – a dog carrier that can be coordinated to suit your own outfit. Whichever option you choose, your dog’s comfort should always be your first consideration. With no entrance fee to pay at all, a trip to the beach can be great fun. Do bear in mind that not all beaches permit dogs all year round, so check before you go. There is something about the open space, the salt in the air, the wind and the seaweed that leave a dog quivering with excitement as he races to the surf, even if he doesn’t actually want to go in the water. By the end of the day you will have a very happy and very tired dog to take home. If you are out all day you will need to eat. Some restaurants will allow your dog entry as well, but no doubt he will always help with any leftovers from your picnic. There is no reason why your dog should not be included in the annual family vacation, and there are even some specialist travel agencies that will help coordinate vacations for both you and your canine pal. There are plenty of hotels that accept dogs and you should look on the Internet for information prior to traveling. Pet friendly hotels are everywhere and reasonably priced these days. Be aware that even if a hotel welcomes dogs it may not actually allow them in the “guest” rooms but only in on-site kennels instead. If you prefer a more home-away-from home environment for your dog, some self-catering vacation cottages usually accept dogs, while the more adventurous might be drawn to a camping trip. There are also many Airbnb bookings which allow dogs for a nominal fee. I highly suggest them as most of the Airbnb reservations will make you and your canine companion feel right at home. Make sure that your dog is fit and healthy before he travels. Do not feed him immediately before traveling. Allow him the opportunity to go to the toilet before he goes in his carrying container. Let him get used to his crate before you travel, so he is happy to be in it. Make sure the crate he is traveling in is spacious and well ventilated. Make sure your dog will have access to water throughout the entire trip. Put a favorite blanket or cushion in the crate to provide him with a little extra comfort. Before you plan the vacation, check that your dog’s vaccinations are up to date and that you have the relevant vaccination documentation from your veterinarian. Some airline companies now actively encourage owners to take their dogs on vacation with them, and one has even launched a frequent-flier incentive, allowing dogs to earn points when they accompany their owners abroad. Once they have completed their first flight, they receive a complementary gift of a doggy T-shirt and sparkly tags. 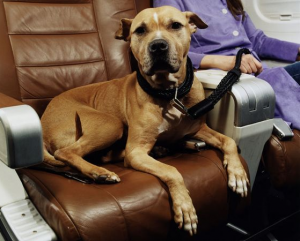 The airline has opened a pet reception center, which provides a full feeding and grooming service to help your dog recover from jet-lag and relax once he is back on home soil. 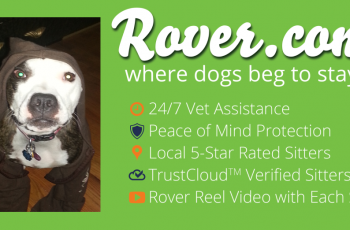 Hopefully, I was able to provide you with some information on how to travel with your dog on short and long distance trips. If you wish to add to my post or would like to add a feedback be sure to comment below. Thanks for the comment and thanks for visiting Destiny 🙂 Have a wonderful day! There is a lot of great information within this post! Another option to keep in mind if you can’t take your loved one with you would be to look into a dog hotel. These facilities normally offer great services to your pet helping them to feel as though they are on vacation. However, it is best to research around to find the one that best fits you and your dog’s needs. Thanks for sharing!